Kate Middleton elegant in Catherine Walker coat on final day of royal tour | HELLO! 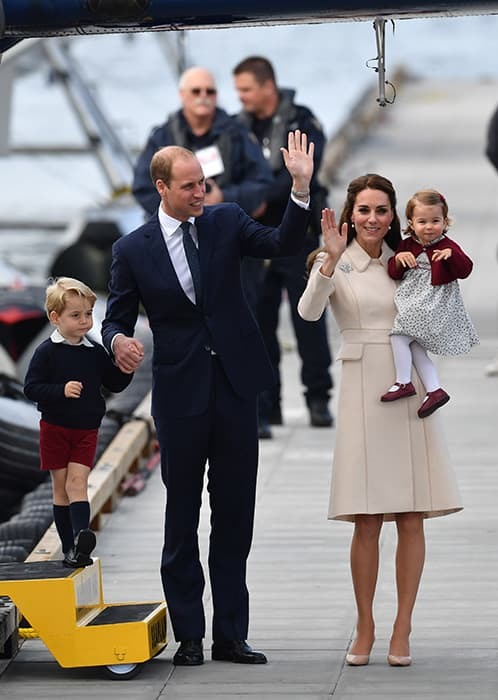 October 02, 2016 - 15:29 BST hellomagazine.com The Duchess of Cambridge wore a demure cream coat to board a seaplane with Prince William and their two children. 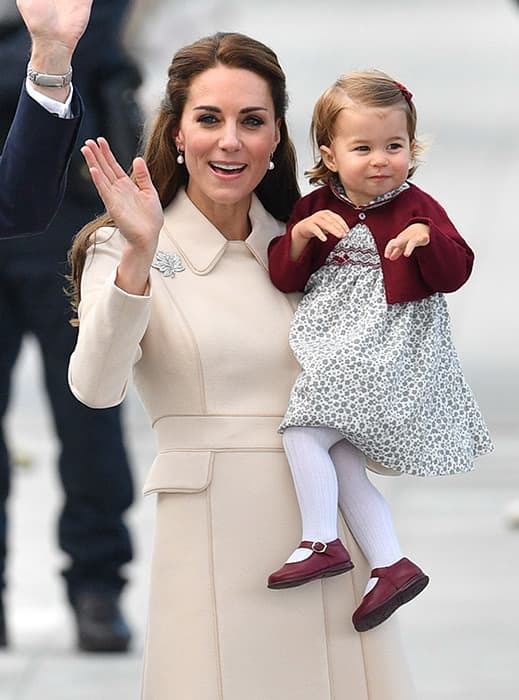 The Duchess of Cambridge looked effortlessly stylish in a stunning Catherine Walker cream coat as she waved goodbye to the crowds before departing on a seaplane with her husband Prince William and their children, Prince George and Princess Charlotte. The royal accessorised the simple yet elegant coat with a pair of cream heeled court shoes and a maple leaf brooch which originally belonged to the Queen. Her long brunette tresses was pinned back, revealing a pair of Annoushka pearl drop earrings to complete the look. Carrying her one-year-old daughter, the mother-of-two chatted to several officials as Prince William walked ahead with Prince George. After accepting a bouquet of flowers, Kate offered them to her daughter to smell, before putting her down for a walk while keeping a hold of her hand. The Duchess has proven her flawless style during the eight-day royal tour, donning both stunning dresses and casualwear for the trip. She has also paid homage to the host country with her outfit choices, including a stunning red Preen gown for a reception at Government House, as well as wearing some pieces by Canadian designers, including a smart jacket by Smythe. She has also proved that she is not afraid to recycle outfits after she was seen wearing a green Hobbs coat first worn at a St Patrick's Day Parade in 2014, along with the Penelope Chilvers boots, retailing at £475. The boots are a particular favourite of Kate's, which she previously wore for her last official royal tour; a trip to India and Bhutan. Prince William and Kate released a video showing favourite moments with their children during the trip earlier today, thanking Canada for their hospitality. They wrote: "We have created such happy memories for our children during this visit #RoyalVisitCanada."